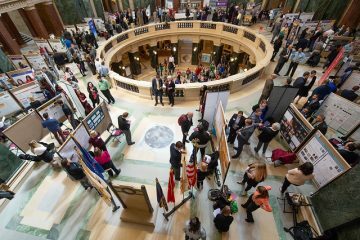 Nine University of Wisconsin Oshkosh undergraduates and their faculty mentors travel to Madison Wednesday to share their scientific findings during the 16th-Annual Research in the Rotunda in the Capitol. The event is sponsored by the UW System—a national leader in undergraduate research, which contributes to retention, graduate rates, workforce and economic development. 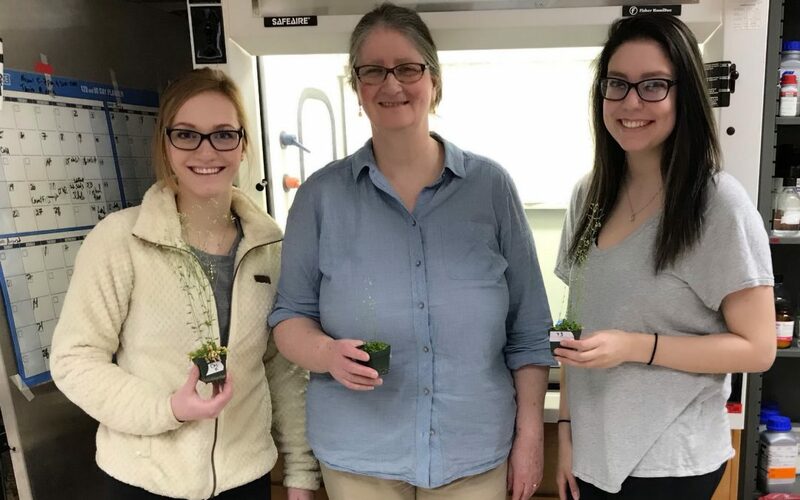 One of the UW Oshkosh poster presentations—developed by biology majors Hayley Vandenboom, a junior from Shiocton, and Angela Vickman, a senior from Wrightstown, with associate professor Lisa Dorn—focuses on Epigenetics and Evolution of Phenotypic plasticity in Arabidopsis thaliana. The small flowering plant Arabidopsis thaliana is a popular model organism for studying plant biology and genetics. “My research project was designed to determine the genetic mechanisms plants have to adapt to changing environments prevalent because of phenomena, such as global warming,” Vandenboom said. Vickman said the goal of her research was to explore the molecular mechanisms that allow plants to respond to environmental changes. “My research is relevant because climate change is happening and plants will be responding to unpredictable environmental factors,” she explained. Vickman plans to apply to medical school following graduation from UWO in May. “My goal is to become an emergency room physician. I’ll be taking a year off to work full time and then hopefully attending medical school the following year,” she said. Brianna Beseler, a junior geography major from Cochrane, worked with faculty mentor Colin Long on Long-Term Fire History from Bass Lake, Northeastern Wisconsin. Michael Clark, a junior geology major from Stevens Point, worked with faculty mentor Eric Hiatt on The Origin and Composition of the Iron-Rich Neda Formation, Eastern Wisconsin: From Ancient Oceans to Economic Iron Ore.
Melanie Gruenstern, a senior anthropology major from Fond du Lac, worked with faculty mentor Jordan Karsten on The Universal PMI: The Effects of Variation and Climate on Decomposition. Kristen Mahan, a senior digital marketing major from Franklin, worked with faculty mentor Maria Novotny on Access to Care: Understanding Male Experiences with Infertility and Alternative Family Building. Eric McDaniel, a sophomore computer science major from Chicago, Illinois, worked with Warren Vaz, of the Fox Valley campus, on Atmospheric Testing Drone. Ben Sumnicht, a junior geography major from Appleton, worked with faculty mentor Erin DeMuynck, of the Fox Valley campus, on The Mile of Music Festival, City Branding and Sense of Place. Michael Watson, a senior physics major, worked with faculty mentor Nadejda Kaltcheva on the Physical Parameters of Luminous Young Stars.